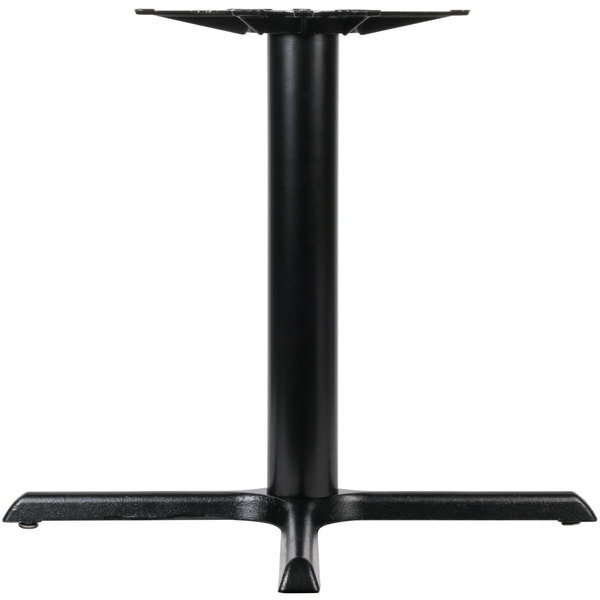 Perfect for virtually any environment, this Lancaster Table & Seating 33" x 33" black 4" standard height column table base is a sturdy, reliable, and attractive choice for your operation. Made of black powder-coated cast iron, the base even comes standard with everything you need, but the table top! A cross base plate helps steady the standard height column, while the table base spider secures your table top to the base. Because the included column measures 4" in diameter, the base ensures that large, heavy, or thick table tops are securely supported at all times. This means that it can safely accommodate tops that thinner columns can't, allowing you to choose from a greater selection of surfaces to best suit your business. Whether you're eyeing stone, marble, or another hefty table top material, you'll be good to go with this strong and well balanced base! Plus, assembly is quick and easy to help you get back to business. A hardware kit is even provided, so you won't have to spend the time tracking down screws and other small parts for installation. Wherever this attractive base is placed, and whatever top it supports, it's sure to stand steady and strong for years to come!